Type – oil water separators come in a variety of types from plain underground vault-type units to double- walled underground units with separation media to above ground units. Materials of Construction – The materials of construction will vary among types of oil water separators. For above ground units can be constructed of PVC plastic for light applications to coated carbon steel to stainless steel. Many underground units are now constructed of steel with fiberglass wrap or coated with a corrosion protection material. 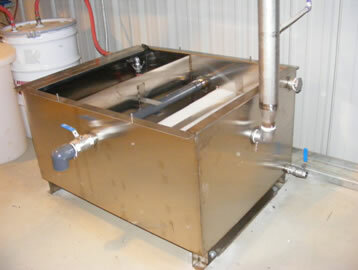 Size & Flowrate – Oil water separators are usually sized based on the flowrate of the water oil mixture to be treated.